The course is appropriate for veterinarians specializing in laboratory animal medicine, especially those preparing for ACLAM board certification. The symposium will present relevant topics in Laboratory Animal Medicine with an emphasis on the American College of Laboratory Animal Medicine (ACLAM) primary species and recent literature. Registration for the workshop is required. The slide collection established by the team at the National Institute of Environmental Health Sciences (NIEHS) will be available for review electronically. This collection includes biology and diseases of many laboratory animal species. Group or individual review of these sets will be available in the NCSU Veterinary Medicine Library. The library will be open May 16th-May 19th, 2019. The ACLAM Mock Exam by the International Mock ACLAM Exam Coalition will be given on Saturday, May 18th, is open to all interested individuals and does not require registration to the symposium. Anyone wishing to attend only the mock exam should contact David Kurtz directly at david.kurtz@nih.gov. This course offers 13 hours each of continuing veterinary medical education for veterinarians by the North Carolina Veterinary Medical Board. Full attendance is required to receive total CVME credit. A block of 40 rooms will be reserved at the Ramada Inn off of 1520 Blue Ridge Road, Raleigh, NC, (919) 832-4100. The special room rate is $69.00 + tax, which includes a complimentary breakfast buffet. Reference the group code GCLABMED19 when making your reservation in order to get the discounted rate. The deadline for this rate is May 1, 2019. No one will be admitted into the workshop without a paid registration. All attendees should have a government-issued photo ID (driver’s license, passport, military ID, etc.). All course handouts will be provided electronically. Attendees are encouraged to bring a device capable of opening PDF or Word documents (e.g., laptop computer, tablet). 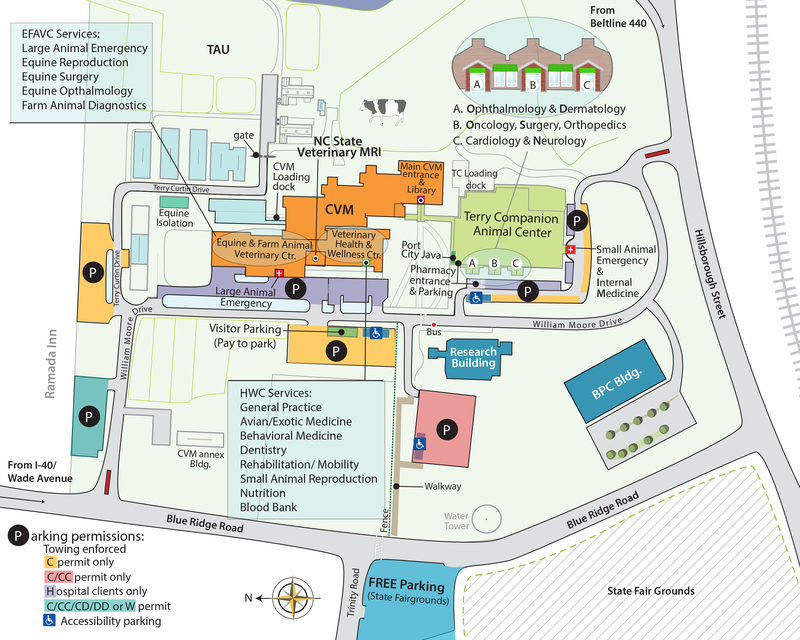 The NCSU College of Veterinary Medicine is a short 3 minute walk from the adjacent hotel (Ramada Inn). Please refer to campus map. The Ramada Inn is seen at the far left of the map. The workshop will be held in South Theater, there will be signs to direct you to the room. Please enter the building through the “Main CVM Entrance” of the main CVM Building at the South end near the new Terry Center. The Veterinary Medicine Library is located in the South end of the CVM Building (far left) near the South Theater. Limited parking for the workshop will be available with permit in the parking deck located behind the Research Building. You may request a parking permit when registering for the course. Free parking is available at the Ramada and at the State Fairgrounds lot located across Blue Ridge Rd. (refer to map). 1:15P - 2:15P The Laboratory Rabbit Allison Williams, DVM, DACLAM - Charles River Laboratories, Inc.
Attendees may request printed copies of the course handouts (black & white only) for an additional cost of $25. This request must be made in advance and the fee must be paid at the time of registration.